Check out our range of fun reptile facts for kids. Learn what reptiles are, how they defend themselves, examples of reptiles and much more. Read on and enjoy a variety of interesting information about reptiles. Nearly all reptiles lay shelled eggs. Reptiles are covered in scales or have a bony external plate such as a shell. Nearly all reptiles are cold blooded. The first reptiles are believed to have evolved around 320 million years ago. The size of reptile’s brains relative to their body is much smaller than that of mammals. Reptiles use a variety of methods to defend themselves from dangerous situations, such as avoidance, camouflage, hissing and biting. Crocodiles and alligators are reptiles. Turtles and tortoises are reptiles. Lizards and snakes are reptiles. Lizard and snake species make up the largest number of different reptiles. 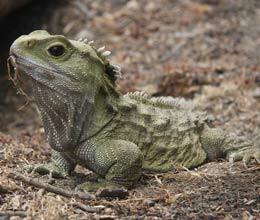 Tuataras found in New Zealand are reptiles.